If you did not enjoy “traditional” chemtrails raining down on you, you are not going to like the new version, which the United States Air Force promises will feature aerial dumps of programmable “smart” molecules tens of thousands of times smaller than the particles already landing people in emergency rooms with respiratory, heart and gastrointestinal complaints. Under development since 1995, the military’s goal is to install microprocessors incorporating gigaflops computer capability into “smart particles” the size of a single molecule. Invisible except under the magnification of powerful microscopes, these nano-size radio-controlled chips are now being made out of mono-atomic gold particles. Networked together on the ground or assembling in the air, thousands of sensors will link into a single supercomputer no larger than a grain of sand. “It is potentially relatively inexpensive to do,” Hall clarified. “About the same price per pound as potatoes.” Why so cheap? 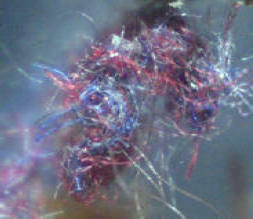 Because nano particles can be potentially self-replicating. That is, they can be made to reproduce themselves until programmed to stop. Hopefully. Maybe. Sometimes. Owning The Weather goes on to say that the USAF will “manage and employ a weather-modification capability by the Weather Force Support Element.” These weather forces will use real-time updates from swarms of the nano-size “smart sensors” to model developing weather patterns with a super-duper computer. Based on continually updated forecast, the weather warriors will fly follow-on missions as needed to tweak the storm. It’s perfect, crows the air force. “The total weather-modification process becomes “a real-time loop of continuous, appropriate, measured interventions, and feedback capable of producing desired weather behavior.” Really? Weather modification did not work too well with Katrina. If the notion of inserting Autonomous Intelligence nanobots into weather systems to monitor, steer and mess with them seems risky, just wait. Around the next cloud corner are coming swarms of airborne nano-bots to optimize wind dispersal patterns for germ warfare. Or chemtrails. But there’s one small hitch. Nobody knows how Earth’s atmosphere works. It is so big, so complex and so unpredictable, even real- time nano-snapshots are ancient history as soon as they are taken. This is why the air force said, “Advances in the science of chaos are critical to this endeavor.” Good luck. After a decade of trying, not even a 48-hour weather forecast can be made without constant surprises. Because they cannot be graphed in a cause-and-effect straight line, chaotic “non-linear” weather processes can morph unexpectedly, defying predicted weather modification inputs. Just ask Beijing. Then there’s the matter of accidental genocide. I mean human health. SICKOS The chemtrails we are too familiar with after a decade-long dose continue to inflict eye infections, nosebleeds, skin sores, muscle pain, chronic exhaustion, weakened immunity, acute asthma and allergies, short-term memory loss and heart attacks on people in more than a dozen countries. 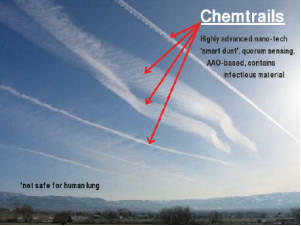 [americanskywatch.com; Chemtrails Confirmed 2008 by William Thomas] Small particulates like the aluminum oxide found in chemtrails also kill. Dr. Dan Woodard calls aluminum oxide a “nuisance dust”. This MD says that prolonged exposures to very high concentrations of particulates that are visible in the air “can produce pulmonary fibrosis, somewhat like the silicosis formerly seen in miners.” “At one time it was thought to precipitate Alzheimer’s disease, but more recent research has shown it is almost certainly unrelated,” Dr. Woodward adds. It’s the tiny size of chemtrail fallout – one-tenth the width of the human hair – that make people very ill. The EPA warns that there is a strong link between all tiny particles and thousands of premature deaths each year. Two key studies from the early 1990′s by the Harvard School of Public Health and the American Cancer Society found strong links between high levels of small particles and a rise in death rates. In an article headlined, “Tiny Particles Can Kill” the August 5, 2000 issue of New Scientist pointed to findings in six cities over 16 years showing that “city-dwellers in Europe and the U.S. are dying young because of microscopic particles in the air.” According to the New York Times, “microscopic motes… are able to infiltrate the tiniest compartments in the lungs and pass readily into the bloodstream.” Particles in the size range called for by the Welsbach Patent describing chemtrails are “most strongly tied to illness and early death, particularly in people who are already susceptible to respiratory problems.” [New York Times Oct 14/06] The Welsbach Patent calls for megatons of 10 micron-size aluminum oxide particles to be spread in the atmosphere. The EPA calls particles this small “an extreme human health hazard” leading to 5% increased death rate within 24 hrs. “Hearts as well as lungs can be damaged by ultra-fine particles small enough to get into the bloodstream and inflame tissues and cells,” reports the LA Times. “After they reach the heart, the particles are thought to cause a stress reaction in cells, producing inflammation that contributes to heart disease. The particles also may cause blood clots.” [Los Angeles Times Dec 29/03] The Neurotoxicology (brain poisoning) division of the U.S. Environmental Protection Agency says that exposure to airborne Particulate Matter “is an environmental health risk of global proportions.” [Health Risks Of Aerosoled Particulates PubMed Abstract] The EPA explains that by penetrating deep into the lungs and circulatory system, these dust-size particles “are implicated in tens of thousands of deaths annually from both respiratory and coronary disease.” POP QUIZ: What do you think will happen when nano-size machines tens of thousands of times smaller than this are sprayed into the open air? “SMART PARTICLES” IN YOUR BRAIN MAKE YOU DEAD Nanoparticles might better be called Nastyparticles because they make a beeline for the brain as soon as they are inhaled. 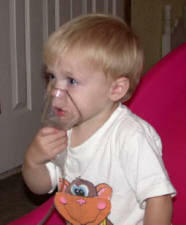 Not surprisingly, they tend to accumulate and clump in the area of the brain that deals with smell. Too big to pass back through the blood-brain barrier, they become trapped there. [Nature.com Jan 5/04] Dr. Celine Filippi also observed that nanoparticles inhaled into the lungs are so mall they easily cross the lung barrier and enter the blood. “Particles in the blood can reach the liver, amongst other organs.” [globalresearch.ca Oct 21/07] NANO CHEMTRAILS So are we being sprayed with nano-chemtrails? Owning The Weather 2025 was published in 1995 and discussed only non-classified military weather modification projects. Hall’s Overview of Nanotechnology also appeared in 1995, when nanotech was in its Frankenstein infancy. Since then, many sources tell us, nanotech has gone exponential. [nanotech-now.com] HANK CALLS The term “nano-chemtrails” on my homepage prompted my trusted military informant I’ve dubbed “Hank” to call. “They have them,” he confirmed. The U.S. Air Force has occasionally added nanoparticles to the chemtrail mix to demonstrate proof of concept. “We’re way beyond science fiction,” Hank confirmed. 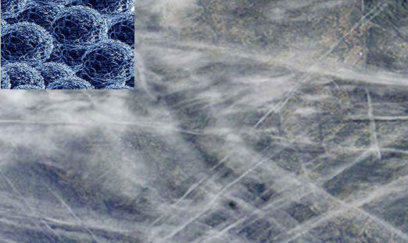 “You can hide just about anything you want in a chemtrail – including nanotubes. Chemtrails are being altered for whatever spectrum of wavelength they’re trying to bounce off of them. 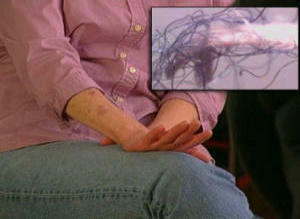 MORGELLONS What about Morgellons? Is there any connection between this bizarre and frightening malady and nano experiments?”You’re not going to like this,” Hank said. “Morgellons is one unintended manifestation of nano spray experiments.”Morgellons manifests – or presents” – as intolerable itching in the skin followed by alien eruptions of thin hairs or tendrils through the skin. “It’s basically the same as excreting something through a hair follicle,” Hank said. He meant a toxin – something foreign to the body. “If you manufacture a liquid super-cyrstalline structure, vibrate it a little and give it an electrical charge – it will form into a chain.” These nanotubes will be invisible to the eye, of course. But their tendency to clump together could eventually make them big enough to be photographed and posted on the web. How much nanocrap has been sprayed so far? “Tens of tons,” he replied. Tens of tons of molecules? “Much of it is still up there,” Hank went on to explain. This is because nanoparticles are so light and small they tend bind to bind with oxygen molecules. And piggybacking on oxygen particles makes them buoyant. “It travels worldwide,” Hank continued. “Some of it comes down. Whatever it’s exposed to up there it brings down here. We get exposed to it. We breathe it in, we ingest it. It accrues in the same spot every time. And attracts more of it… ” In the liver. And brain. “The fallout would look like a prion disease,” Hank said. “Fallout from nanoparticles would eat holes in our brains?” “Pretty much. Nano particles are ionized particles that go to what attracts them…. Because of their electro-chemical properties, they are attracted to the potassium-calcium channel in the brain.” Think about it, he said. “If they are capable of withstanding the corrosive upper atmosphere – corrosive sunlight and all those (industrial) chemicals – what would they have to be manufactured out of? Does the body manufacture anything that can deal with that? Who will come forward and say these are good?